No one knows for sure when people first reached the Copper River Basin of Interior Alaska, but by 8,000 years ago, caribou hunters began visiting Tangle Lakes at the head of the Gulkana River. As glacial ice retreated, they eventually entered the Wrangell Mountains. The Ahtna, Tanana, Eyak and Tlingit peoples lived across the landscape. European exploration of the Copper Basin began in the early 1780s by the Russians, who by 1819 established a trading post. The United States Army explored and mapped Alaska in 1885, followed by several other scientific expeditions. Discoveries of gold, chalcocite, copper, silver, and mineral deposits peaked further interest. 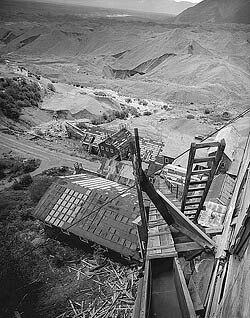 Mining operations were run into the mid-20th century. Alaska became a state in 1959. In 1978, President Jimmy Carter declared the area a National Monument for its scientific and cultural significance, specifically “the greatest assemblage of mountain peaks over 14,500 feet ... found in the Nation .. an active glacial complex ... mudcones and hot springs ... ecological islands ... [t]hree major culture areas converge here ... the North Athapascans, the Pacific Eskimo, and the Chugach” (Proc. No. 4625). On October 24, 1979, Wrangell-St. Elias was designated a World Heritage Site. Congress passed the Alaska National Interest Lands Conservation Act in 1980, placing 104.5 million acres of Alaska under permanent federal protection. On December 2, President Carter designated 13.2 million acres of land as Wrangell St.-Elias National Park and Preserve. Today, over 57,000 visitors annually visit the over 13 million acres of Wrangell-St. Elias National Park and Preserve to enjoy the natural beauty of Alaska and learn about its native peoples. The protection of land also enables us to appreciate the archeologically-told stories of the past. The park contains an important grouping of Athabascan prehistoric and historic archeological sites, the remains of other cultural groups such as the Tlingit and Eyak Indians, and the Chugach Eskimos. It also contains historic ruins and structures representing the periods of exploration, mining, and transportation. The primary values of the cultural sites lie in the contribution they can make to our understanding of human interaction with the park environment over time, aboriginal culture change and adaptation, the results of culture contact between native and Euroamerican groups, and the development of Alaska after contact.